Did you know that in only a few hours, a faded, dreary asphalt pavement surface could be restored, almost like new? The magic of sealcoating is real and we’d love to share the fascinating facts about sealcoating with you. Sealcoating a thin liquid layer added over a paved surface to protect it from damage caused by UV rays, rain and snow, and fluids from vehicles. Sealcoating won’t cure existing issues, like cracks, but is will help prevent such damage from forming in the first place. Aside from keeping out damaging elements, properly applying a sealcoat is important to extend the life of asphalt paving. Here is a list of seven facts you likely did not know about sealcoating! Sealcoating protects and prolongs the life expectancy of asphalt pavement by filling surface damage and providing a protective layer to keep out damaging UV rays, vehicle fluids and water. The low cost of regular sealcoating can save you money in the long run. A properly maintained and sealed asphalt surface has an extended lifetime and reduces long-term repair costs. With exposure to the elements, asphalt pavement over time becomes faded in appearance. 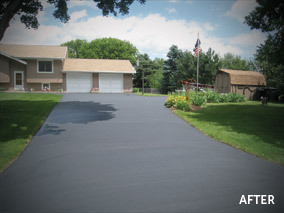 A fresh sealcoat application enhances the appearance of asphalt, making it look and wear like new. Sealcoating is typically done using one of two application methods: spray or squeegee. Sealcoating accelerates the melting process of snow and ice on pavement surfaces. This helps to protect against water penetration, rain, frost and snow damage. To properly complete the sealcoating process, the air and pavement temperature is recommended to be at least 55 degrees Fahrenheit for the duration of application and for eight hours following the application. Prior to pavement sealing, the asphalt surface should be cleared of all dirt and debris. In addition, minor repairs, like potholes and cracks, should be filled and vehicle fluids, like oil, should be properly removed. Did you know all of these fascinating facts about sealcoating? If you want to keep your asphalt surface smooth, functional, and attractive, you might consider a sealcoating application. With more than 75 years of experience, Wolf Paving can offer you a free detailed quote on your next paving project. If you live or work in the Milwaukee area, call us at 262-965-2121. For the Madison area, call us at 608-249-7931.